SANTIAGO: Prominent Chilean Catholic priest Oscar Munoz, who held senior positions in the archdiocese of Santiago, was detained Thursday over allegations that he sexually abused seven children —the latest pedophilia scandal to grip the country’s church. The alleged abuse by Munoz, 56, took place from 2002 in the capital Santiago and the southern city of Rancagua, prosecutor Emiliano Arias said. 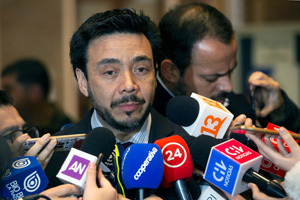 Munoz was vice-chancellor and then chancellor in the archdiocese of Santiago from 2011, before he was removed two months ago after admitting in January, days before Pope Francis’ visit to Chile, that he had abused a minor. He was initially investigated by the Chilean church, which then referred the case to the Vatican. The abuse was uncovered by Chilean prosecutors when the church’s case file was seized during a June operation. Arias confirmed the investigation included a possible cover-up involving senior members of the clergy, among them the two most recent archbishops of Santiago, Francisco Javier Errazuriz and Ricardo Ezzati. Chilean police also set up an email address appealing for any other allegations related to the case. The Chilean church has been hit by pedophilia scandals implicating dozens of priests.